After a client has posted a job vacancy at Sribulancer, freelancers will start sending proposals or job applications. You will get email notifications for every proposal sent by freelancers to your Sribulancer inbox. 1. Follow the link from the email that will direct you to your Sribulancer profile. You may also login to your Sribulancer website to access them. 2. Click on the bell symbol with a red notification. Client can access the proposals either through "Inbox" or "Posted Jobs" to view all the listed freelancers who send proposals. 3. On the next page, you'll be able to see the freelancers' profile and start sorting as per your need. Price Bid that is submitted by the freelancer on the upper right side. Click the “Add Shortlist” button to mark a potential candidate. Click the "Eliminate" button to eliminate a non-potential freelancer. Click the "Add Favorite" button to add a certain favorite freelancer to your list. Click the "Start Chat" button to begin communicating with a freelancer. You may also click on their view profile to study a freelancer further. 4. If you are interested with a certain freelancer and need to begin chat, you'll be connected through a Sribulancer messenger platform immediately. Always use Sribulancer messenger platform to begin all discussions in regards to your project, scope of work, time expectation, project amount and other issues related to the job. 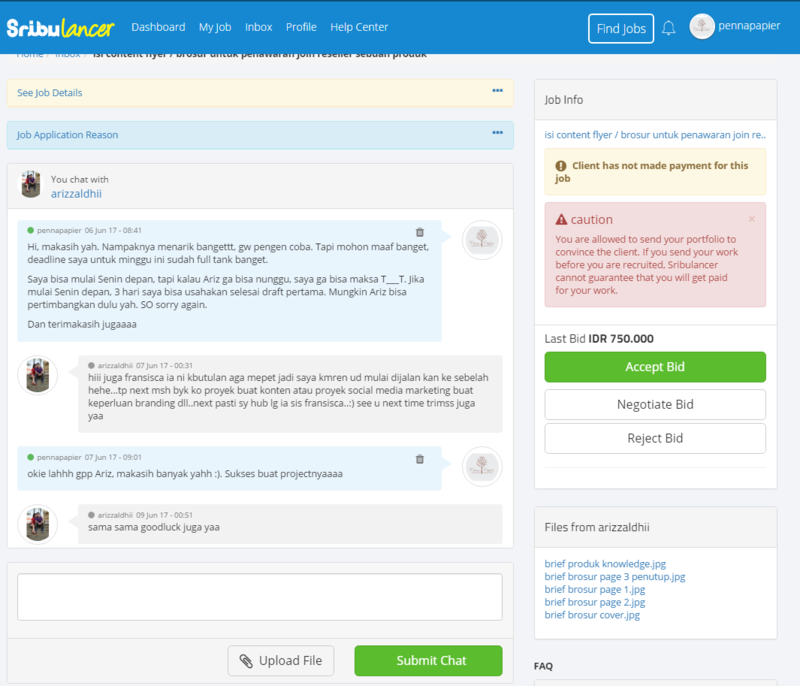 You can also see the offer made by the freelancer and there's also a negotiation and upload file feature for the most convenient project discussion. 5. During the negotiation process, simply key in the offer amount in the space provided or click "Accept & Recruit" once a final amount is reached.